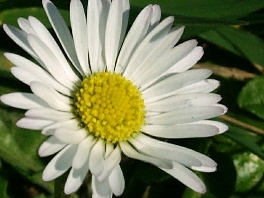 Daisy is a flower, wellknown and loved by kids. This little flower colours the meadows with white and yellow dots. Modern phytotherapy doesn't use the Daisy as a remedial herb, but countryside people love to use the Daisy for a lot of purposes. A tea made from the leaves of the daisy strengthens the appetite and the metabolism. It stimulates the digestion and can also allay coughs. With its diureting effects daisy tea can help against swollen feet. Externally used the Daisy can help against rashes and wounds. Daisy can be used as tea or as tincture. The main use of Daisy is as a tea. To prepare a Daisy tea pour one cup of boiling water over one or two spoonful of Daisy. Wait for five up to ten minutes, than filter the tea and drink it slowly. You can drink one up to three cups of Daisy tea each day. A tincture of Daisy can be bought (i.e. in pharmacies) or prepared by yourself. 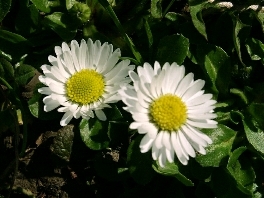 To prepare a Daisy tincture, fill some Daisy in a glass. Pour some grain alcohol in the glass, enough to cover the herbs. Close the glass and let it stand at a warm place for two up to six weeks. After the waiting time filter the tincture and pour it into a dark bottle. Use 10 up to 50 drops of the tincture up to three times daily. You can use the tincture pure or diluted with water. Daisy can be used internally against colds and cuogh. It also helps against weakness of the digestive system. You can use Daisy also to ally swollen feet. Daisy tincture or tea can be used external as poultice, in washings or as bath. This can help against bad healing wounds, rashes and skin inflammations. Daisy is at home in Europe. You can find the Daisy at meadows, in gardens and beside roads. 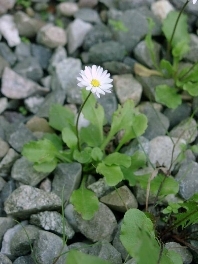 Daisy can grow up to 15 centimeters high. It is an perennial plant. The stem of the Daisy is thin. The leaves are shaped like eggs. Their colour is light green. From march to august the flowers are blossoming. They are white and yellow with lots of petals.